Lately, John Galliano has been perfecting a new design skill, something he coins the artisanal décortiqué technique. This consists of reducing a garment to its core structure – to “a memory of it”, as the designer puts it – and redefining its blueprint by building it back up layer by layer in new formation. 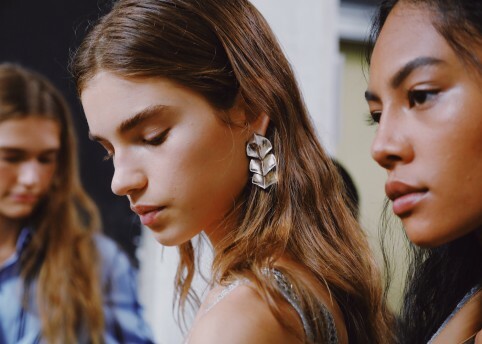 It’s something we saw in his FW18 Maison Margiela collection – turning coats into neo-futuristic clouds and slipdresses to delicate strands of fabric – and we saw it before this season’s show, via six videos introducing Galliano’s debut fragrance for Margiela, Mutiny. “Create the rules. Then break them.” Said Willow Smith in one of the six short films introducing Mutiny. 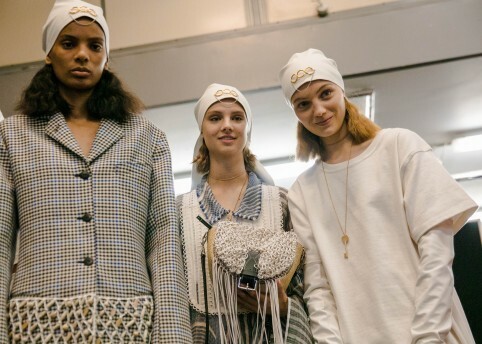 A montage of six young women, including models Hanne Gaby Odiele and Teddy Quinlivan, also spoke to camera about cultural topics such as gender equality, again in unison with Galliano’s co-ed collection. The idea of carefully constructed pieces, paired back and broken down to expose elements (stitching, loose threads, buttons) highlights the finesse of craftsmanship beneath the surface of perfect tailoring. 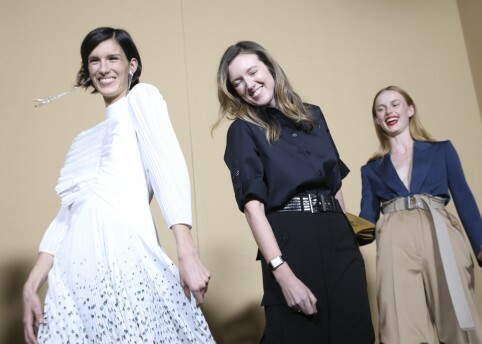 Conversely, the idea of wearing something that doesn’t fall in line with what’s classically complete shows an air of confidence, liberation –if any fashion house can turn the ‘unfinished’ into wearable art, it’s Maison Margiela. 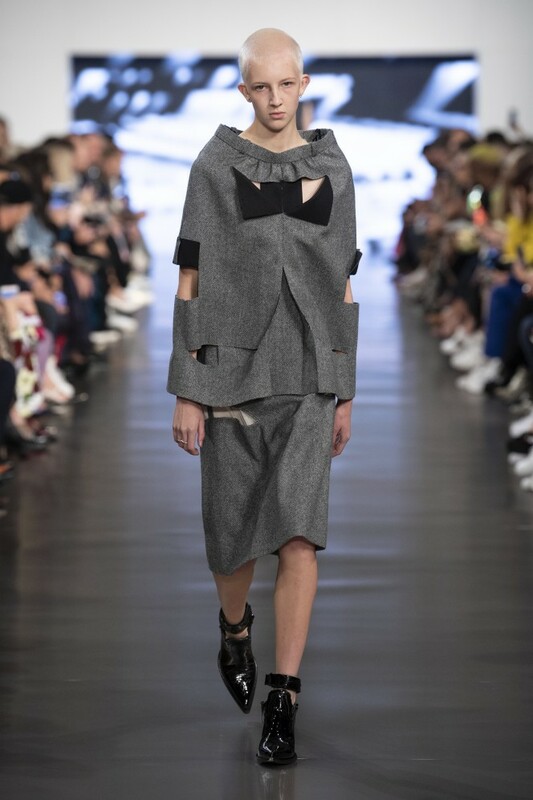 A monochrome palette worked in favour of strong, straight lines, rough cut seams and layering – sheer organza slips teamed with tweed pinafores and long overcoats – the frayed edges could be taken as an act of rebellion, or ‘frayed’ society or ideas. 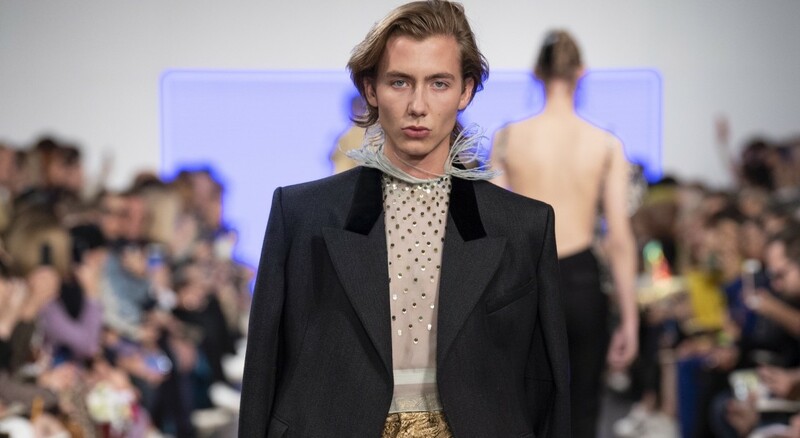 As clothes looked torn apart – “nomadic cutting” – we’re urged to look for the “memory of”: the memory of how we know a trench coat to be vs. what’s presented on the runway, the memory of what once was a top and is now a skirt, the memory of gender roles vs. an open mind, the memory of old vs. new. In Galliano’s Margiela, there are more questions than answers. 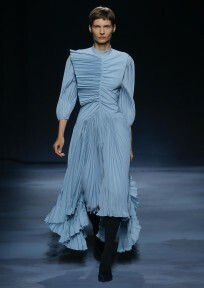 Technique turned to materials to also smash conventions of masculine and feminine, with the use of wools against crêpe satin and chiffon, and boys walking the runway in party dresses and lipstick. 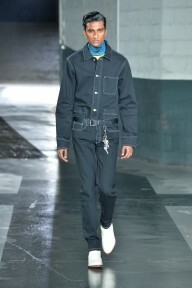 In deconstruction, Maison Margiela constructs how fashion is simply needle and thread, cut cloth, patterns pieced together to make one unique article, and how like human beings, when taken back to its core elements proves that there’s more similarity than disparity.